Lorenz showed, however, that if he were the first mover that a gosling saw, it would be imprinted on Lorenz and follow him about, refusing to follow a goose. A goose could even imprint on a toy train and ignore other geese, even its own mother. Later, as adults, these geese would even choose toy trains for their life partners (which didn’t work out well for the geese — or the trains). Lorenz won the Nobel Prize for this work in 1973. Human babies also learn by imprinting, though ours is more complex, more forgiving, and occurs during a longer critical window. In particular human babies imprint on food. This is a highly adaptive mechanism — but in the second half of the twentieth century we have unwittingly imprinted our children on the wrong tastes and textures. They will chase after junk food and kids meals, and ignore a delicious, ripe peach or tomato packed with nutrients their bodies crave. Feeding Baby Green unveils the key windows of opportunities for our children, and how the imprinting occurs using not just taste but all of the senses, from pregnancy through age 2 (and beyond — with a final chapter giving an overview up to age 9). It’s time to imprint our babies with healthy foods. In Feeding Baby Green I show families how to do this with the 8 essential steps for cultivating Nutritional Intelligence at each developmental stage. 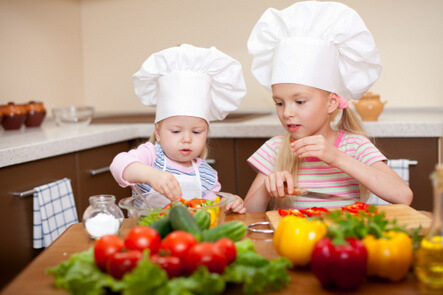 Feeding Baby Green provides recipes and easy food ideas at each stage to help you enjoy healthy amounts of great food together as a family – starting before a baby is born, and even sharing the same food during infancy and toddlerhood. The idea of baby food (and later, of kids’ meals) is a recently created myth. It didn’t exist when my father was born. But by the time I was born, almost every baby in the U.S. ate mostly jarred baby food, and we are reaping the consequences of this today. Baby food can have a place in a healthy childhood, but not as the knee-jerk centerpiece of infant nutrition. The best foods on which to imprint are often foods that are local, sustainably/organically grown, in season, ripe, and recently picked (or frozen when picked) — or from animals raised in a sustainable way (without routine antibiotics, extra hormones, or feed that is foreign to that animal). These foods have the flavors and the complex nutrients on which we developed to thrive. It turns out these same foods and methods of agriculture are often the best for the planet. Agriculture and the transportation, processing, storage, and preparation of food are a big part of our ecological impact. When it comes to environmental impact, how a family eats is more important than the type of car they choose to drive. Feeding Baby Green is a win for us all, with profound answers to problems as apparently diverse as the childhood obesity epidemic and climate change. It’s time for a revolution – a Delicious Revolution.